(1) Caves are large, deep, and tend not to contain much organic matter for organisms to munch on. They're often found in karst and volcanic areas prone to developing big holes. Caves tend to get all the attention because we can squeeze into them and wander around. (2) Interstitial spaces are tiny. They're the gaps between particles making up soils or underlying water-filled layers of gravel and sand (aquifers). Interstitial spaces are usually not much larger than the organisms found within them. Being hemmed in on all sides has resulted in these organisms typically being smaller and having shortened appendages compared to the inhabitants of larger underground spaces. (3) Unlike caves and interstitial spaces, shallow subterranean habitats are always found near (<10 m from) the surface, are small but not tiny, and usually contain lots of organic matter for critters to eat. Examples include holes in bedrock created by weathering (e.g. limestone being slowly eaten away at by rainwater), cavities within a pile of rocks (e.g. lava clinker), and the space beside and underneath streams through which water flows (the hyporheic zone). Another type of shallow subterranean habitat is a seepage spring (see plate 1). It's essentially a very small yet persistent wetland where water slowly flows to the surface from a shallow underground source (the flow can stop when it's hot and dry). The fancy term for the underground part is a hypotelminorheic habitat. If you've ever been out walking in a temperate forest full of deciduous trees and spotted an isolated dark wet spot where there is a slight depression in the leaf-covered ground, you may have been looking at a seepage spring. They're typically full of blackened, decaying leaves. At the base of the spring, usually less than 50 cm beneath the surface, lies an impermeable layer of clay. This clay keeps the water where it is, blocking it from moving deeper into the ground (it's a sort of small perched aquifer). Seepage springs are inhabited by leaf-eating crustaceans such as amphipods and isopods. They hang out in spaces between decomposing leaves, feeding on their surroundings. Even though their home is near the surface, some of these creatures resemble the inhabitants of much deeper and consistently dark caves in that they lack eyes and pigmentation. In other words, they exhibit troglomorphism. One of the dark-adapted residents of seepage springs is Stygobromus kenki (aka Kenk's amphipod) (see above photo), which only occurs within a couple dozen square miles of land draining to the Potomac River near Washington, DC. 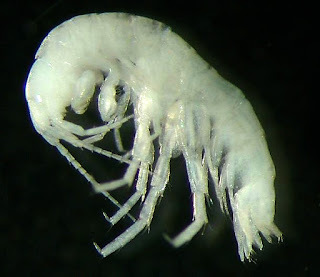 Due to its highly constrained and easily disturbed habitat, this amphipod is at risk of becoming extinct. Culver D, Pipan T, Gottstein S. 2006. Hypotelminorheic - A unique freshwater habitat. Subterranean Biology 4(59):1-7.